To learn how to write calligraphy, you need to be familiar with the three most basic calligraphy skills described (and illustrated) below. It’s also an advantage to write your calligraphy on a sloping surface. Learning how to write calligraphy in the Western world means learning how to manipulate a ‘thick-and-thin’ effect which pleases the eye with a flowing, regular pattern. This broad, flat structure means that the nib creates a distinctive ‘thick-and-thin’ effect when it moves over the page, and this effect is what makes calligraphic letters look so nice. 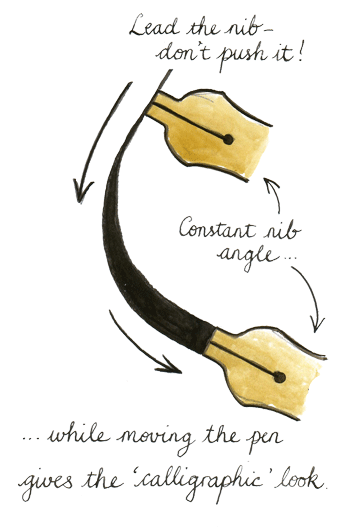 The nib should not turn as you form lines and curves. 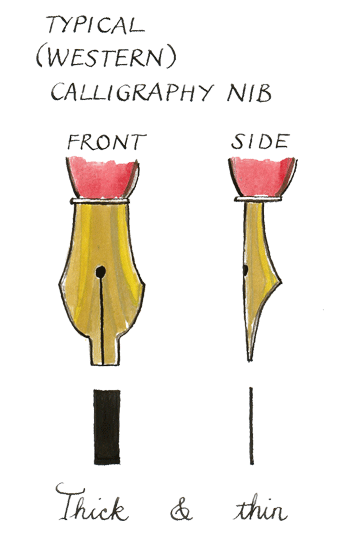 It should always point in the same direction, like a compass needle, whatever the pen and your hand are doing. This give regularity to the script. 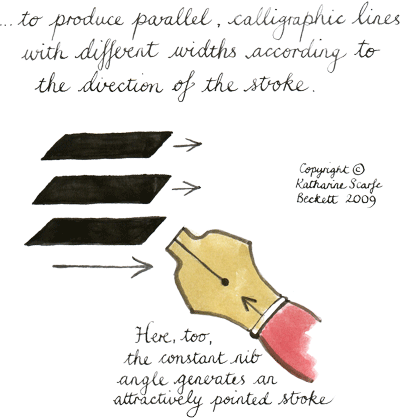 This is the foundation of how to write calligraphic letterforms. 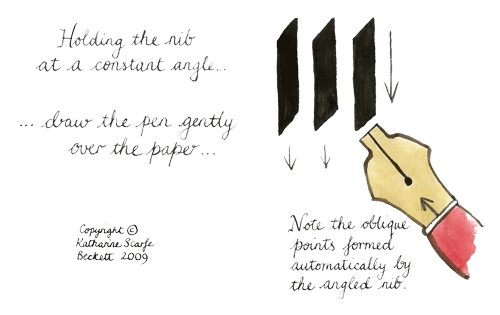 Lead the nib gently across the paper, moving it backwards or sideways from the direction it's pointing in. Use little pressure and keep your hand barely touching the paper - try not to lean heavily on your hand, wrist, forearm or elbow. Many beginning calligraphers never realize that these are all separate skills, and they don't find out why they can’t make the effects they want. Just because you were drawing a vertical line before and now you are drawing a horizontal line does not mean that you alter your pen-angle! And just because you are not holding your pen at a vertical angle (for example) does not mean that you cannot draw a vertical line! 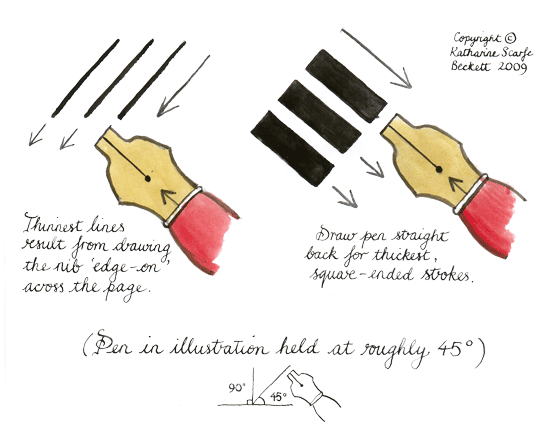 Keeping a light, constant pressure on the nib (skill no. 2) is separate again, and is necessary to create even letterforms and layouts. When those skills are separate in your head and (more importantly) in your hand, you’ve mastered the basics of how to write calligraphy. That’s the essential simplicity of it. 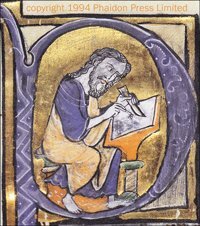 So now you've grasped the basic principles of Western calligraphic writing (at least as I understand them!) you may be wondering what is next? Just as in skiing or learning a foreign language or memorising a routine ... next is PRACTICE. Ask any calligrapher! The thick-and-thin effect and small decorative tags or serifs which were created by our early nibs became the standard appearance for good writing. They can still be seen in traditional typefaces or fonts such as Times New Roman. More ‘modern’ fonts such as Arial (and most other internet-friendly typefaces) have removed the thick-and-thin effect and the serifs. Such fonts are called ‘sans-serif’ ('without serifs') for that reason. They are easier to read than traditional letters on a glowing screen – but they look bland, impersonal and utilitarian on paper.